Stamps – deer and tree from Stampendous “Birch Buddies”; Sentiment from Inkadinkado “Expressions/Salutations.” Images colored with Copic markers. I made this card with the current sketch at Operation Write Home Stars and Stamps (Sketch #71). This card will be shipped to the troops as part of the second million that OWH will be sending. 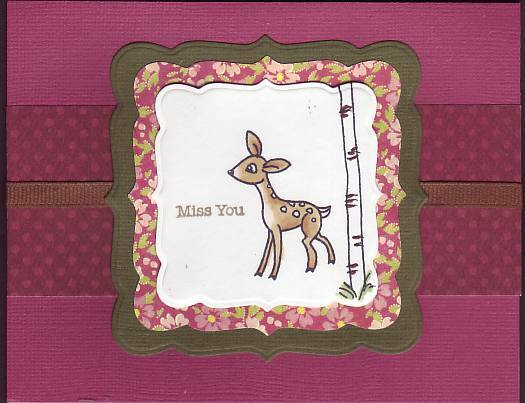 This entry was posted on Tuesday, May 31st, 2011 at 10:45 pm	and tagged with cardmaking, clean and simple stamping, stamping and posted in Challenges, General Cards, OWH. You can follow any responses to this entry through the RSS 2.0 feed. So cute, Yvonne! I love the use of Nesties for the center square in the sketch. Thanks for joining us in this week’s OWH Stars & Stamps Sketch Challenge! What an adorable little fawn! This is such a cute card. Sweet card…very nice colors… love the mini print!